The Krome EX expands on the original model, capable of everything from in-depth sound creation to full 16 track sequencer capabilities. A refreshed case design with a new colour houses a new set of PCM sounds designed for todays musical genres. All the high class pianos, strings, guitars and bread and butter sounds are there with a boosted selection of sounds focusing on EDM, ethnic and holywood style movie sounds. All of this with powerful 16 track recording and editing makes the Krome EX an all round musical production instrument. 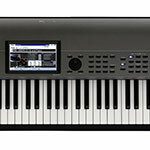 The KROME EX is equipped with host of new sound including new grand piano sounds. These sounds were recorded under the supervision of Seigen Ono, the authority on DSD recording and mastering, and provide a beautifully clear sound that builds on the success of the "German D Grand" that exemplifies the original KROME. An upright piano frequently used in pop has also been added. 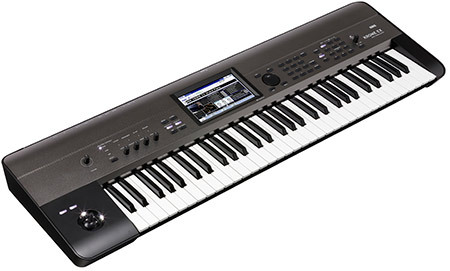 As well as acoustic pianos there is a large range of electric pianos to choose from. There are in fact 3 different styles of electric piano built in and they can all be tweaked processed and enhanced using in-built amp simulators and effects. Each one makes use of 8 velocity layered samples for absolutely stunning quality. From pianos to synth, brass, strings, guitars and everything in-between, the KROME EX is equipped with every essential sound you will ever need. Even the drum kits received special attention with 48 pre-loaded kits making use of over 2500 drum samples! Kits such as Jazz Ambience allow users to control mic positioning, ambient drum and dry level controls for an incredibly authentic sound experience. Add additional life to your performance with the built in drum track feature. There are more than 600 preset patterns to choose from and space for saving user patterns as well. Drum patterns can be created and used with the sequencer, as well as providing a rhythm guide while you play, or they can be used creatively in your live performances. In combi or sequencer mode there is access to 2x arpeggiator systems. Each can run simultaneously and offers an array of choice from simply arp up and down patterns through to complete phrases, guitar riffs, lead patterns and more. Use them to add extra depth to your performance or create ideas for your musical creations. You can even edit the preset patterns to create your own unique arpeggiators. 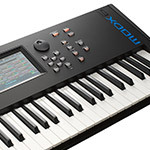 The KROME EX has a powerful arrangement of song production tools. A 16 track MIDI sequencer offers a versatile way to record, edit and master your song creations. Instantly record your current playing setup direct to the sequencer to start you off then build up track by track using normal recording or looping capabilities. Go in depth with full piano roll edit mode and make use of a rich array of effects for adding depth and motion to your music. You can even record arpeggiators and drum tracks in to your songs. 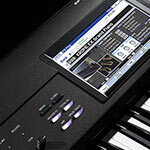 All access to the sequencer, sounds, editing and more is direct through the large colour touch screen interface. The screen clarity and response makes navigating and operating the KROME EX system easy and intuitive. Combination: Max 16 parts. For each Timbre, keyboard and velocity split/layer/crossfades. Modifications to the program settings via the Tone Adjust function. Others: Configurable "Trigger Mode / Sync / Zone"
Cue List function: 20 Cue List, Songs can be arranged consecutively or repeatedly in up to 99 steps, a cue list can be converted back into a song. Weight: 7.2 kg / 15.87 lbs.